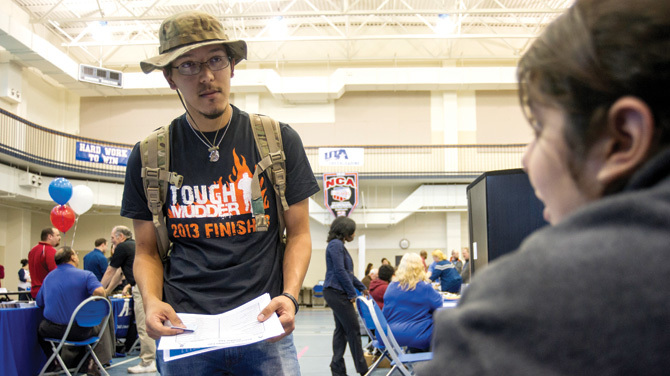 UT Arlington is among the top colleges for military veterans. According to the Best for Vets: Colleges 2015 rankings by Military Times, the University ranked No. 36 of four-year schools that offer bachelor’s or graduate degrees or both. The survey focused on veterans’ academic success, including graduation, retention, persistence, and completion rates. UT Arlington has nearly 3,000 student veterans or their dependents among its more than 40,000 students. Because students are asked to identify themselves as veterans, actual veteran enrollment may be larger.